Today has enough troubles of it’s own. I realized that many of the things that were consuming my thoughts and overwhelming me were not even things I COULD do today even if I did have time. Others things that were consuming some time were things that probably should wait until another day. 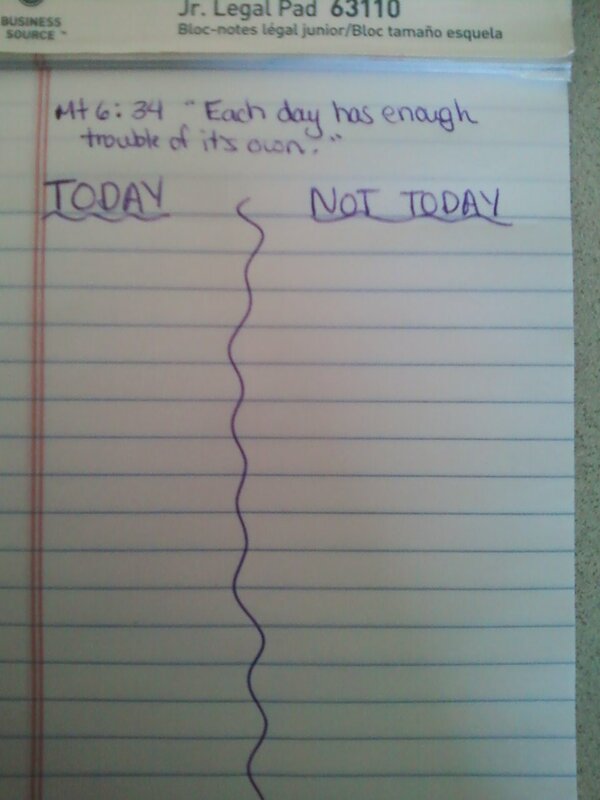 So, whenever a thought came into my head of something that needed done, I simply could ask myself, “Is this something God is asking me to worry about today?” If so, it went on the left column, if not, I could put it on the right column and rest in the fact that I wouldn’t forget about it, but realized that it wasn’t something I needed to worry about right this moment. The coolest thing is, that as I’ve done this for a few days, I’ve never even finished everything on my “today” list… but I always accomplished what REALLY needed to be done in that day. God’s wisdom is so clear in this photo. I think I just might try it myself. Thank you for this, Bekah. SO true! This is one of my favorite biblical passages, because once I realized its power, I’ve tried my best to be faithful in following its direction. It makes SUCH a difference to live life one day at a time.